One year ago a 7.8 magnitude earthquake devastated central and Eastern Nepal. A year later, with the help of LWF communities are being re-built. While millions of earthquake survivors will spend another monsoon season in temporary shelters, mountain communities worry about preserving their unique heritage, which draws countless tourists to Nepal. LWF Nepal and its partners help communities in the high Himalayas to build back their homes stronger, in the traditional way. (LWI) – It is early morning and the rising sun throws a beam of light into the shadowed Gatlang Valley, a Tamang community in the high Himalayas, close to the border with Tibet. The village was hard hit by last year’s earthquake. All the traditional houses collapsed and four people died. Once considered an example of unique mountain architecture, Gatlang, like any other village in Nepal’s worst affected districts, now is made up of rubble and shelters made from zinc sheets. 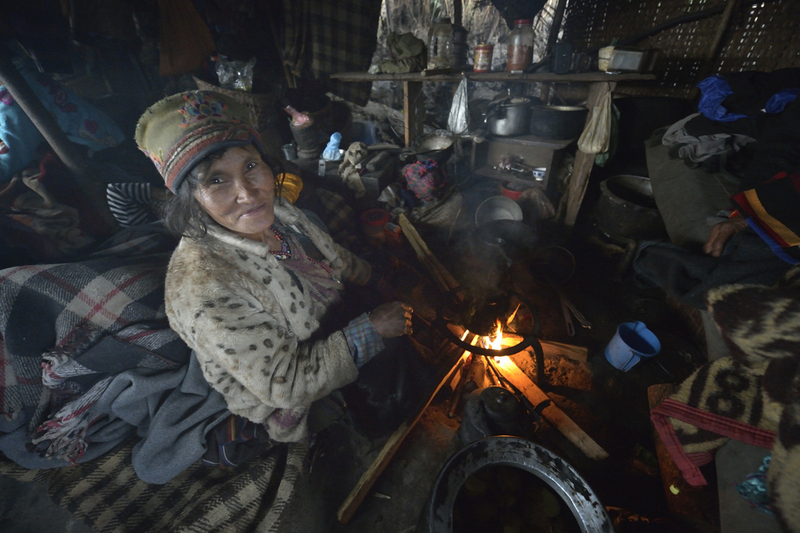 In one of the temporary shelters, Pasang Tamang prepares breakfast for her family. The young mother of two has been living in a hut made from corrugated iron sheets and recycled wood from her damaged house for close to a year. Pasang tells us she is worried, not only about the delay in reconstruction, but also about the way the houses of Gatlang will be rebuilt. Pasang is not alone in her worries. Across Nepal people are concerned about a loss of heritage after the 2015 earthquake destroyed or damaged over 750,000 homes. Although the relief provided by LWF Nepal and its partners and other agencies has been hailed as timely and effective, the survivors, one year after the disaster, still mostly live in temporary shelters or risk their lives by moving back into their damaged homes. Millions of people brace themselves once more for the monsoon season, which lasts for four months and unleashes heavy rains which damage shelters and lead to dangerous landslides. The delay in reconstruction was caused by a political crisis following the passing of a new constitution in September 2015, and delays in setting up a National Reconstruction Authority to oversee the distribution of government support and approves designs for earthquake-resilient houses. Although the use of stones and wood is allowed, people have to follow strict and go through a lengthy approval process. Reconstruction is not only about rebuilding homes, but also about rebuilding heritage. Culture is the heart of our nation. Gatlang’s architecture was unique and attracted countless tourists. So rebuilding in the traditional style is important to recover livelihoods. LWF Nepal joined hands with Islamic Relief Worldwide and local partner Manekor Society Nepal to support communities in five communities of Rasuwa district. The communities will select 230 vulnerable families to rebuild their home. LWF Nepal also prepares the people for rebuilding their homes by providing training in masonry. The training is crucial to ensure the new houses have a strong structure when using locally available materials like stones, mud and wood. By now 150 community members, including many women, have been trained in masonry. Meanwhile in Gatlang people prepare themselves for the one year commemoration of the 25 April earthquake. “We are grateful for the support we got so far, but are concerned about spending another monsoon and possibly another winter in homes that are inappropriate for this climate,” says Pasang. While others remain asleep in the early morning, a woman heats water for tea over a fire in her family's temporary shelter in the village of Gatlang, in the Rasuwa District of Nepal near the country's border with Tibet. The village was hard hit by last year’s earthquake. All the traditional houses collapsed and four people died. Once considered an example of unique mountain architecture, Gatlang, like many other villages in Nepal’s worst affected districts, now is made up of rubble and shelters made from zinc sheets. 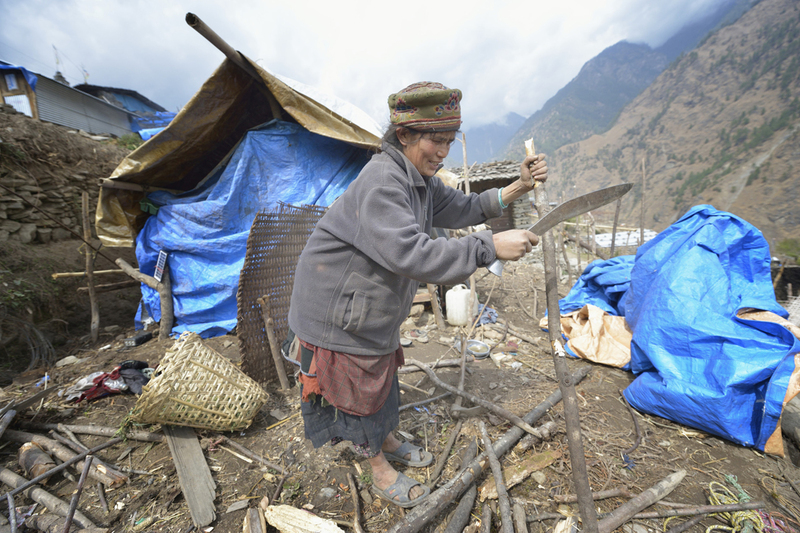 A Tamang woman cuts branches to make a temporary shelter. To shield against the cold in the mountains, the entire village was built from wood. Because even the roofs were made from wood, the village is known as ‘Black Village’ and used to attract many tourists. 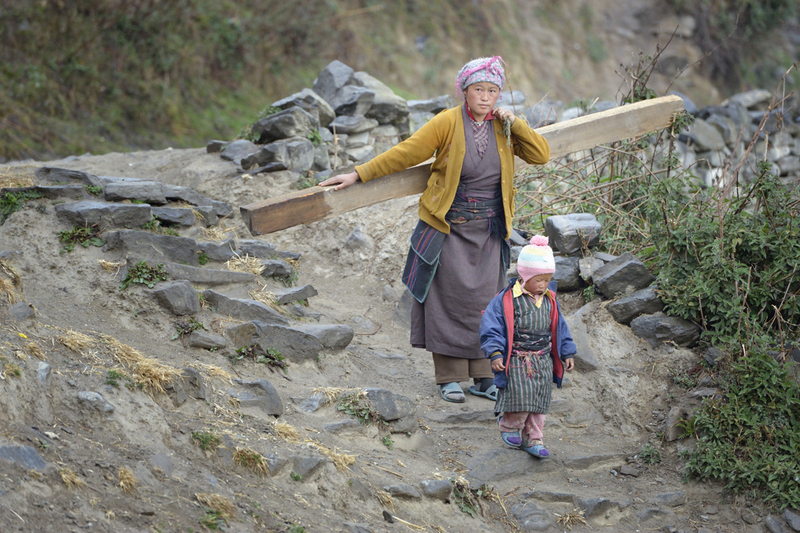 A woman carries a beam for her new house through the village of Gatlang. 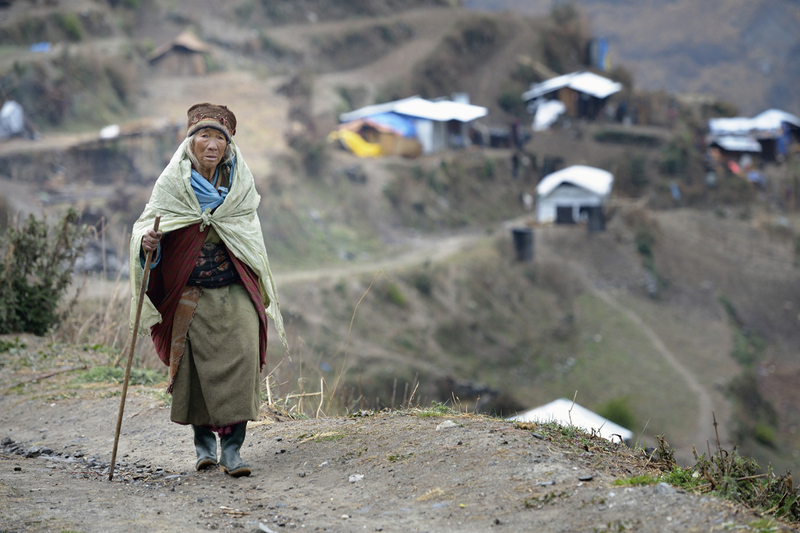 In the aftermath of the April 2015 earthquake, the Lutheran World Federation, a member of the ACT Alliance, helped people in this village with a variety of services, including shelter and livelihood assistance. 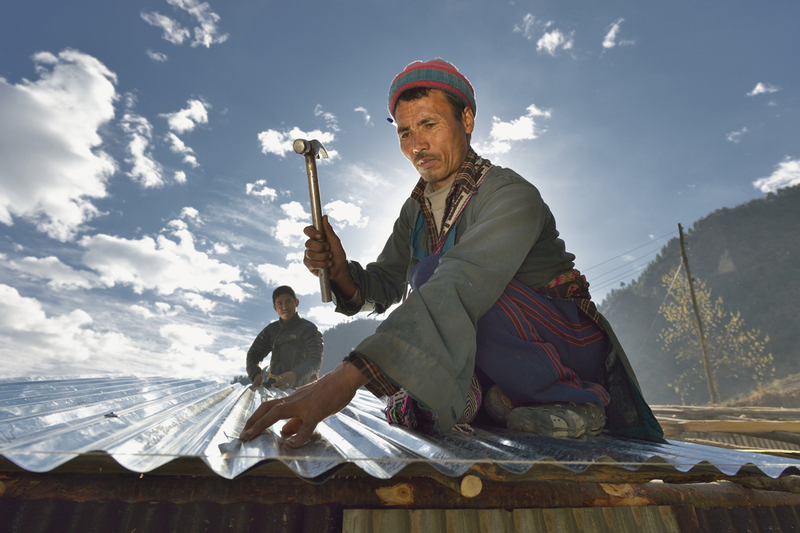 A man nails on tin roofing provided by ACT Alliance as he puts the finishing touches on a transitional shelter. Traditional split-wood roofs of the village have been replaced with tin sheets in the wake of the quake. 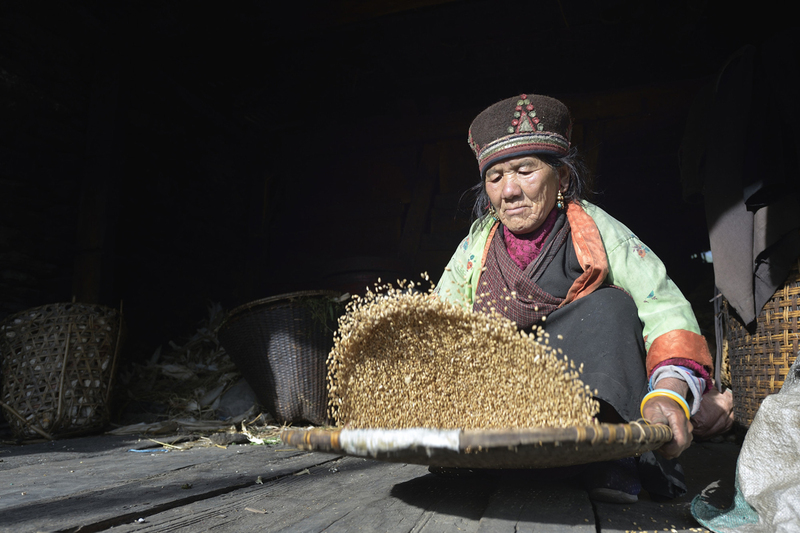 Pasang Bri Ghale winnows grain at her home in the Tamang village of Goljung, in the Rasuwa District of Nepal near the country's border with Tibet. 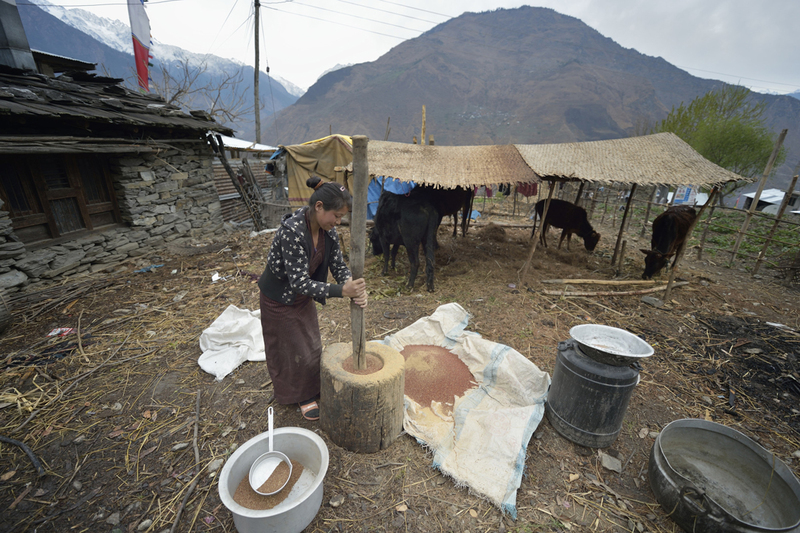 Sita Ghale, 14, uses a pestle and mortar to grind grain in the village of Goljung, in the Rasuwa District of Nepal near the country's border with Tibet. Preserving traditional lifestyle also means re-building villagers’ livelihoods. 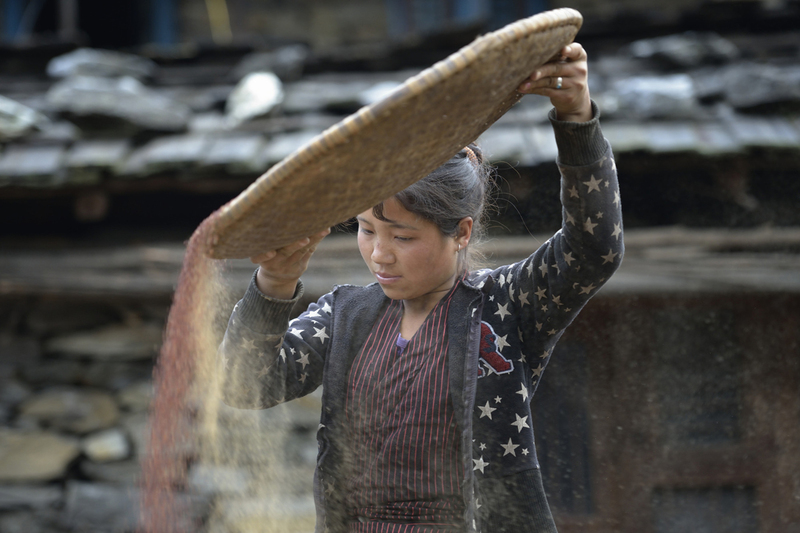 Sita Ghale, 14, winnows chaff from grain. Her village Goljung is located in the same district and was equally affected by the earthquake one year ago. 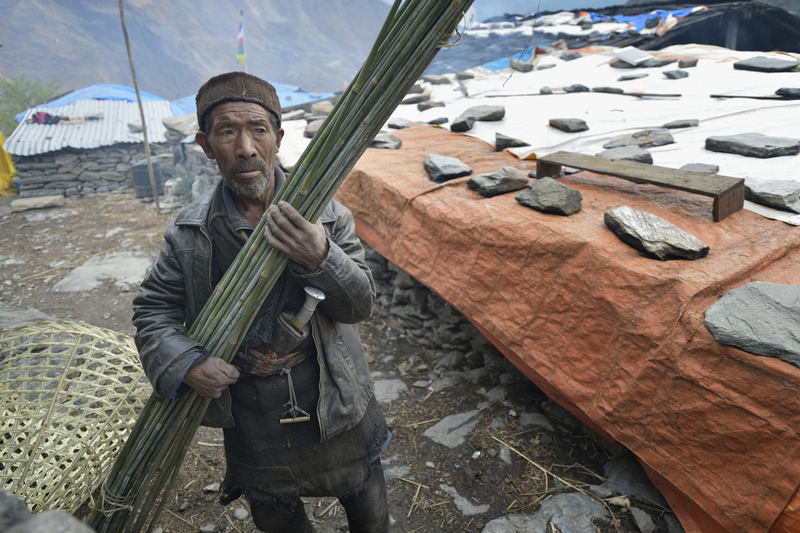 Anaju Tamang, 67, holds reeds he is going to cut and weave into a mat in Goljung village. With the help of the LWF they plan to re-build in the traditional way. 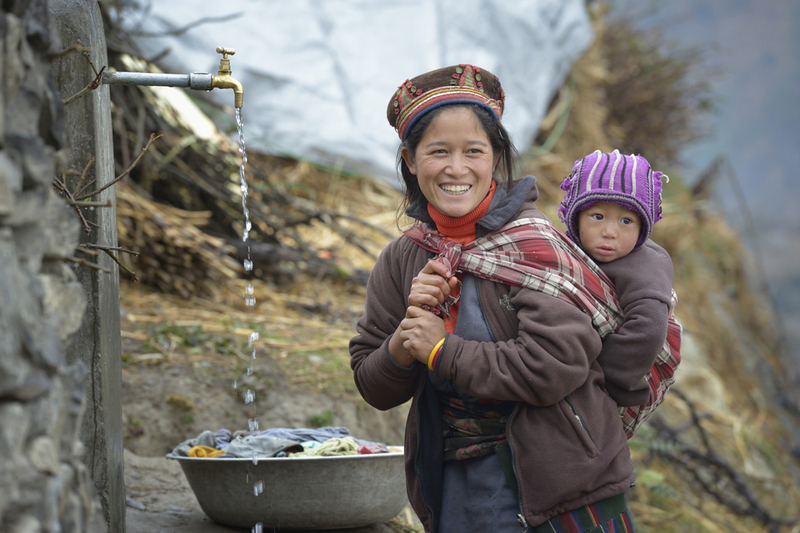 A woman and child obtain water at a communal tap in the village of Gatlang, in the Rasuwa District of Nepal near the country's border with Tibet. LWF Nepal also prepares the people for rebuilding their homes by training them to build quake-proof. By now 150 community members, including many women, have been trained in masonry.